Biking is a commuting option that can significantly reduce your commuting costs and be part of a program for better health and fitness. Biking also reduces automobile traffic, which helps to improve air quality. If you are a beginner bicyclist please visit our new page featuring tips and information on how you can get started, click below on the topic that interests you. Employers can help encourage biking to work by offering bike racks, lockers, showering and/or changing facilities. For businesses interested in encouraging employees to bike to work, we have experience in ordering stationary bike racks for our employer partners; please contact us if you would like a staff member to help your company in making this type of a purchase. Commuter Services also has free programs available to help encourage employees to try bicycling. To learn more about our free services, please contact us. 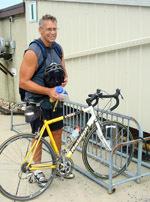 John S. commutes to work at Lancaster Labs by bicycle. An employee at Dart Container uses his bike to make trips between company facilities during the work day. BARTA, Capital Area Transit, Lebanon Transit, Pocono Pony, rabbittransit, and Red Rose Transit have bike racks on their buses, and there usually are bike racks at Amtrak stations. Be sure you are enrolled in the Emergency Ride Home Program, if you use options like biking or walking at least two days a week. The ERH Program reimburses you for a ride home in the event of a qualified emergency. If you haven’t already, enroll online on the Emergency Ride Home page.